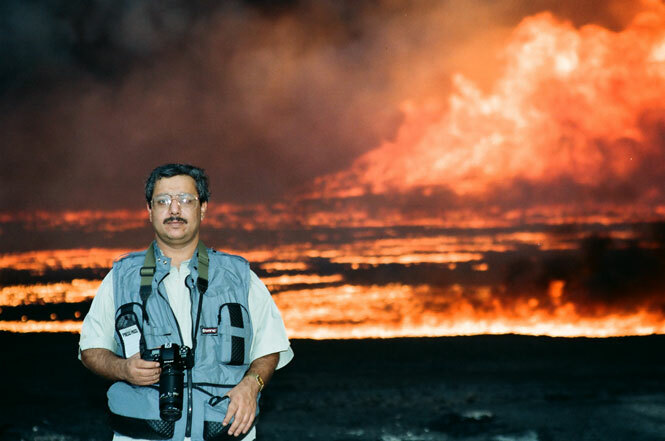 Adel Al-Yousifi is a Kuwaiti businessman, photographer, publisher, and social reformer. He awoke in London on the morning of August 2, 1990, to hear Iraqi troops were overrunning his country. After liberation, he returned to Kuwait as soon as air flight was permitted in March 1991 and found utter ruin surrounded by an inferno. and began recording the devastation. Starting in the South, he made expeditions into the desert and then worked his way up the Coast, to the City, the Suburbs, and finally the North. Al-Yousifi took pictures every day from March till the last fire was put out in November. The result, amassed in 15,000 photos, is evidence of the extent of Iraq's massive looting, vandalism, and arson. The website's owner and photographer was at the Burgan oil field in southern Kuwait in April 1991.